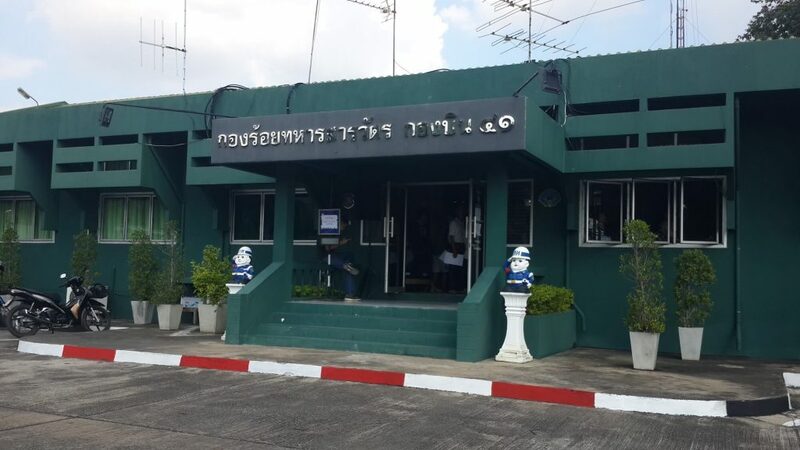 Wing 41 Royal Thai Air Force Base occupies a prime location in the center of Chiang Mai, wedged between the Nimman Road area and Chiang Mai International Airport. 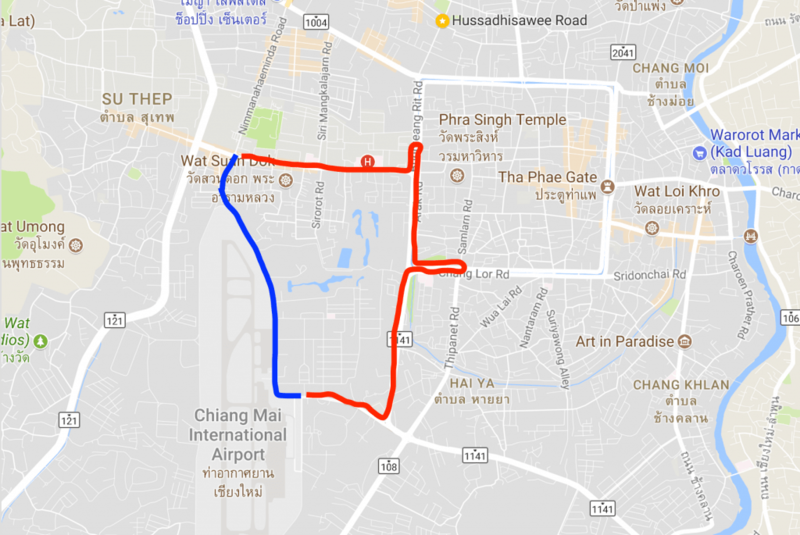 The base is not open to regular traffic, which means a trip between the Chiang Mai University or Nimman areas and the airport usually involves a long detour around the one-way streets of the moat, requiring a couple U-turns and stopping at several traffic lights. The good news for those in the know, however, is you can acquire a vehicle sticker that allows you to take a shortcut through Wing 41 Road. This will save you considerable time since Suthep Road and the moat are often congested at peak times such as afternoons and weekends. Not only is the Wing 41 vehicle pass ideal for those who frequent the airport, but it’s also extremely useful for anyone living on the south side of town when driving to the Nimman area. It would also save you a lot of time if you’re on the west part of town and want to get to Central Airport Plaza shopping center in a hurry. On the map below, you can see how much shorter the driving distance is between the Suthep-Nimman intersection and the entrance to Chiang Mai International Airport when using the shortcut. The usual driving route around the corner of the moat is in red and the Wing 41 Road is in blue. Unfortunately, applications for the vehicle sticker are only open for a limited time each year and involve a bit of bureaucratic hassle. Have no fear, though, because we’ve got all the information you need right here to get your Wing 41 sticker. When Can You Apply For a Wing 41 Pass? Applications for the Wing 41 pass are open during the months of November and December, and the pass is valid for the following calendar year. Specifically, for a 2019 pass you must apply between November 1-December 28, 2018. The office for applications is open Monday-Friday from 8:30-11:30 AM and 1:30-3:30 PM. Please note that on Wednesdays the office is only open in the morning. When you arrive at the Wing 41 Gate from the end of Nimman Road, inform the guard that you’re applying for a sticker and they will allow you to enter. Then proceed straight ahead to the green building shown below. It will be located on the left side of the road after a few hundred meters. 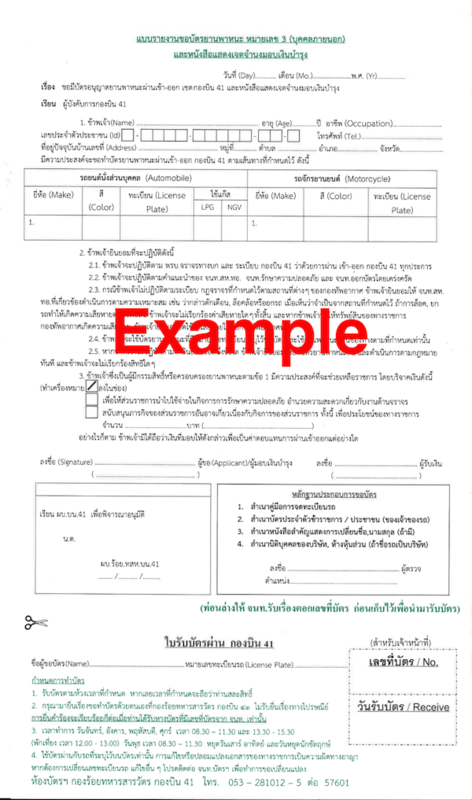 Here you will need to pay 5 baht to get the application form. You will need one application form per vehicle. Once you have your application form, fill it out and wait in one of the three lines. When you finally get to the window at the front of the line, they will check your paperwork. If anything is incorrect or missing, you’ll be asked to correct it. After your paperwork has been checked, you will then proceed to a single line to pay for the application. Once you have paid, they will tear off the bottom portion of the application and stamp it with a collection date. You will have up to one month from the collection date to pick up your sticker. If you are too late to pick it up, the sticker could be revoked, so don’t forget. Try to apply as early as possible. The office opens at 8:30 AM. During peak times you can wait up to 1-2 hours. 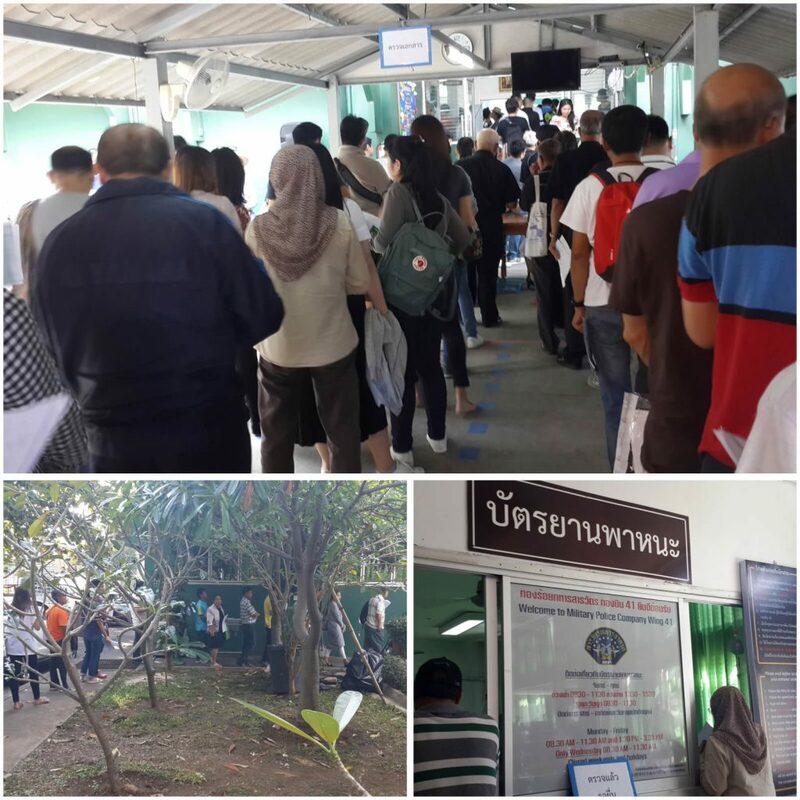 Expect some applicants to be applying for 10-20 vehicles at once, which can delay the line. Take some water. You’ll be waiting outside the building and it gets hot. Take a fan to cool yourself if you have one. You can apply on behalf of friends if you have all the correct paperwork. They have a 2-hour lunch break from 11:30-1:30, so avoid this time or you’ll have a very long wait. The office is not open Wednesday afternoons. The office is closed Sat, Sun and Holidays. In 2017, December 5 and 11 are National Holidays. The road is strictly open between the hours of 6 AM – 10 PM daily. Your sticker must be clearly visible on the vehicle, and it can only be used for the specific vehicle that it was issued for. Make sure to follow the Wing 41 Road rules. You could have your sticker confiscated at any time for breaking the rules and this will go into consideration when making any future applications. If driving a motorcycle, you must wear a helmet, which you should always be doing anyways. Also remember that the sticker is only valid for one year, so you’ll have to re-apply the following November-December for the next year. Although it’s a slight hassle to apply for the Wing 41 Road pass, the convenience of using this route will be worth it for anyone who travels between the west and south sides of the city on a regular basis.